It’s time to learn your ABC with one new letter every day. 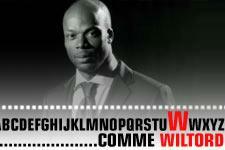 Today it’s time for W… as in Wiltord. One of the key elements in the Lyon squad. Nino added another line to his incredible record. He scored some important goals, set up goals and, as always, gave everything, never holding back… and everything tied together by his outstanding technique and his desire to never, ever accept defeat. Wiltord turned 32 last May, but honestly, he resembles more a junior of 12 years of age than an experienced pro. Wiltord played 46 official matches, not counting his turn-outs for the France team. He is slowly reaching the 300 Ligue 1 matches and has already scored 82 goals. And he does it all by respecting the rules of the game. Not one yellow card in the league all season and just one little booking in the’ Champions League. This extraordinary footballer deserves respect. And he was never the last to start a party in the change-rooms… hats off!